Who switched off summer ? Oh boy where did the summer go? Autumn seems to have stuck its size 9 in the door. The nights are drawing in and the mornings are cool. (That’s if I can be persuaded to get out of bed before the sun eventually comes out to warm things up!) After a disastrous start to the year my garden had been well disappointing to say the least this year. Lack of attention being the main factor. But all is not lost things have been happening we now have 2 green fences one more to do but that’s going to be done in October. The bottom border is still suffering from lack of plants nice weeds but no proper planting yet. I had a real hard time deciding what to do but next summer its going to become a jewelled garden (thank you Monty Don for the inspiration!) I intend to pack it full of hot bright colours some of which are going to be started from seed very soon. Some are already under way. Still a bit of tweaking to do on the plan but all will be reviled in time. So how has your summer been I have a lot of reading to do! If I haven’t visited in a while my apologies I will try my best to catch up as soon as possible. I don’t have lots of lovely flowers to share with you but here are a couple of photos of my star in the garden at the moment. Next post: Awkward Orchid ! 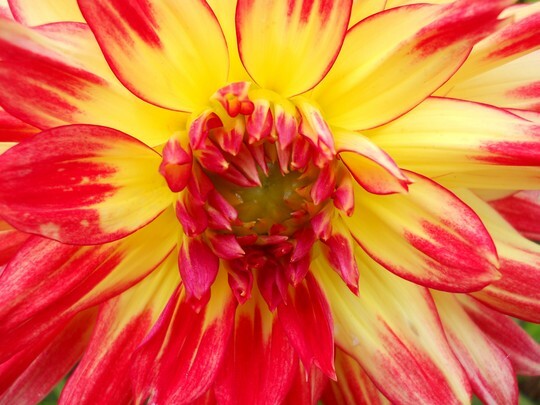 Your dahlia is a beauty. What is it's name? I grow 2 in my garden; one is burgundy and has survived, left in the ground over winter, for 3 years now - it is massive this year and has many, many flowers. The other is Bishop of something (sorry, can't remember it's name). I bought 3 of these but only one survived the slugs and it is flowering quite well now. 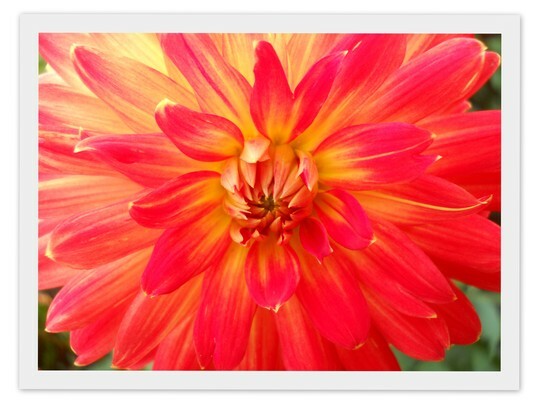 Dahlias are lovely flowers and well worth having in the garden. Lincslass ~ it’s lovely to be back, life is getting back to normal slowly. I have missed my garden so much no hanging baskets or flower filled borders this past summer and don't get me started on the veg plot disaster area! Next spring will be here before we know it. Having a severe lack of flowers in my garden this year has been a real nightmare nothing much to look at and no seeds to collect. Perennials will be on my list along with an abundance of annuals. I hope to grow most from seed I have loads of packets of seeds from Amateur Gardening magazine in my seed tin I must go through I’m sure I will be having a share out soon keep you posted ! Phs ~ Thank you for your kind comment. This is a dahlia I cross bread a couple of years ago so it has no name. I am going to lift it and next spring take cuttings. I will make a note to contact you and send you one if you would like it. To Veg Or Not To Veg That Is The Big Question.